Today is my Grandpa’s 96th Birthday! I rarely get to see him–I live so far away. But I’m proud and feel lucky to be his granddaughter and to carry on his lineage. I’m happy to know that today all of his children have traveled afar to be with him on his special day. He has lived such an amazing life and has a huge family tree legacy. 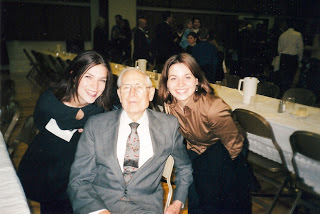 Below is an old picture of me, my sister, Grandpa at Grandma’s funeral. The post Happy 96th Birthday! appeared first on Darling Darleen | A Lifestyle Design Blog .